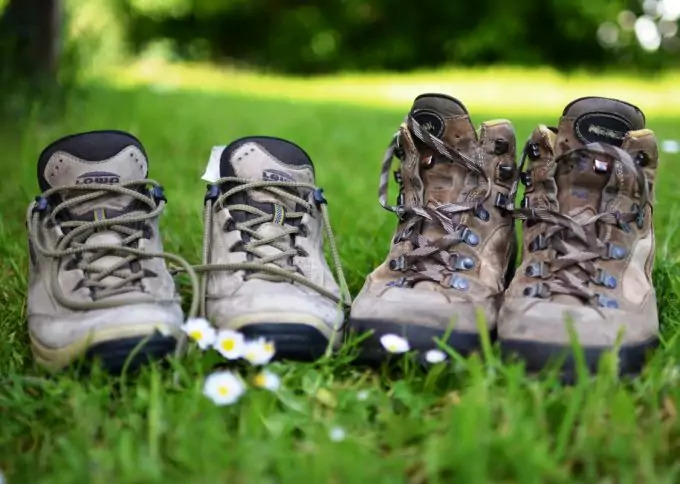 If you’re the type of person that loves to spend time outside then one of the first things you need is to find the best hiking boots available. After all, hiking boots are going to make it much easier to for you to do a lot of things outdoors. Whether you like just going hiking, going camping, mountain climbing or even hunting, you’re going to want some good quality hiking boots to take with you because that’s how you’re going to stay safer and definitely a whole lot warmer too. Of course, there are plenty of benefits to hiking boots and we’ll talk about each of them throughout this article. The important thing to consider is what happens when you’re going camping and hiking. Make sure you’re comparing plenty of different options and then what fits you the best. 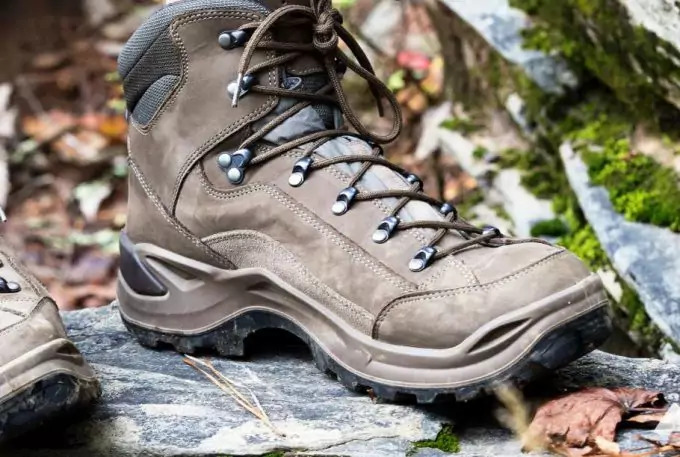 Over this article, we’re going to talk about the best options and all the different things about hiking boots that you need to consider before you purchase your first pair. Make sure you’re getting the ones that fit all of your needs and consider all the different aspects related to materials, quality and make-up. By spending some time looking at the options, you’ll have a better idea of what you’re looking for right from the start. The first thing you should know is that all hiking boots are not created equally. There are several different types of boots that are going to work for different environments and different uses. 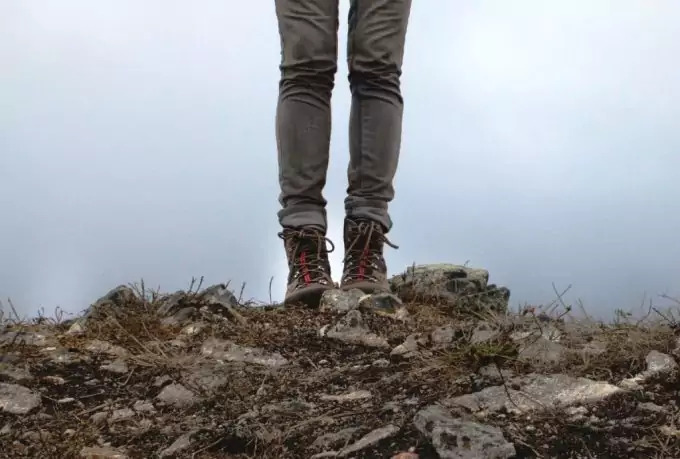 If you’re the type of person who feels more comfortable wearing hiking boots than regular tennis shoes, for example, you don’t need the same boots that someone who plans to climb a mountain is going to need. And of course, if you’re looking to climb a mountain you don’t want the same shoes you would be wearing on a normal day out and about. Hiking shoes are the first option to choose from. Usually the lease expensive, these boots are going to offer you an ultra-light, low-cut shoe that’s flexible enough for easy motion but still sturdy enough to walk in throughout the day. 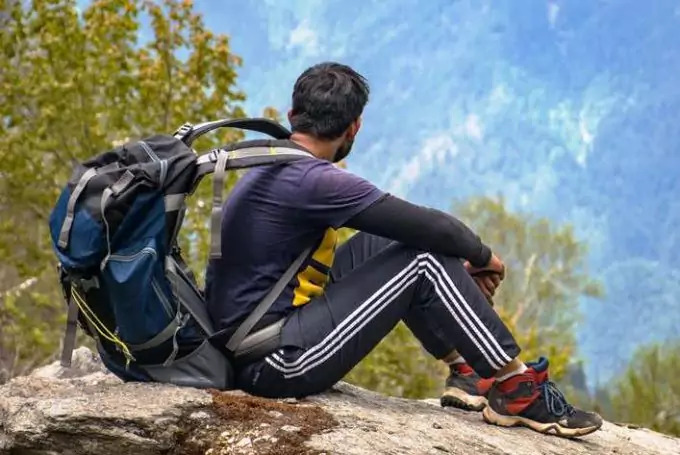 You’ll be comfortable enough wearing them to hike for a short period of time or to go backpacking (again for short periods of time) but you’re not going to want these if you plan on going on a long trip or to be hiking extensively or in extreme terrain. Hiking boots are going to cut around your ankle or a little bit higher. They are able to keep your feet stable and supported during short hikes (like those you’d take with your hiking shoes) and usually a little longer like a weekend trip. You’re only going to want a light load with them because they are a little lighter than other versions but you’ll be able to break them in pretty easily. This makes them a good shoe for those who are just getting started with hiking or backpacking and aren’t quite sure about what they’re going to be doing in the long run. 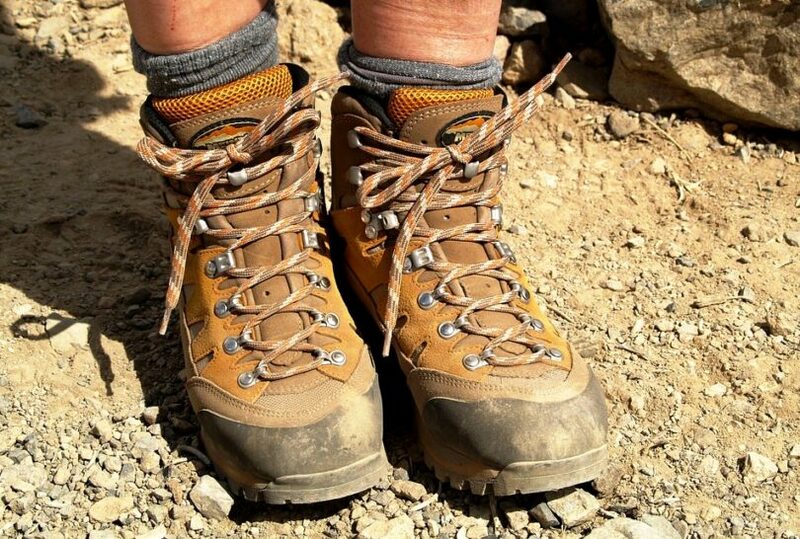 For useful tips on how to break in your hiking boots, see our must-read article on this topic. Backpacking boots are actually going to provide you with a lot more stability and durability. They come above your ankle to provide you with the support you need in rougher terrain or if you’re going to be hiking for long periods of time. These are able to support you when you carry a heavy load, even a multi-day load, and will give you stiffer soles, which means more support for your arches as well. They’re intended for off-road walking and they’re made to last a lot longer than lighter shoes and hiking boots. Mountaineering boots are the final ones we’ll talk about and these are definitely the most durable. They allow you to take on a heavy pack or load if you’re going somewhere for a longer period of time. They also have a stiff midsole and they come up above your ankles even further than traditional hiking or backpacking boots. They provide you with even more support and durability because they’re made for not only off-road walking but entirely off the beaten trail. You can wear them mountain climbing and can even attach crampons to travel across glaciers. These are going to be heavier to carry themselves, but they do make up for it in ability. If you’re looking for hiking boots you need to make sure that you’re getting the best ones possible and that means looking at a whole lot of boots. Of course, which ones you want will depend a little on what you’re planning to do in them. If you’re only planning on using them for camping, for example, you might not need quite as fancy of boots. However, if you’re actually planning on hiking you need something higher quality. 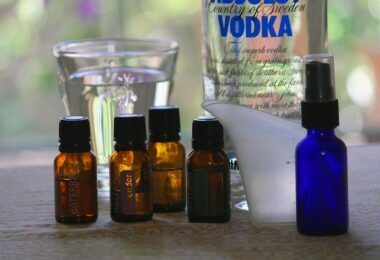 But some of these you’ll need no matter what. Uppers for your boots are the part that goes around your ankle. These uppers can be made of a variety of different fabrics from full-grain leather and split-grain leather to nubuck leather, synthetics and waterproof. Some are even branded with vegan or insulated uppers. Full-grain leather uppers are extremely durable and water resistant. These are not very light or breathable and definitely need a lot of time to break in, but they are going to last longer than other varieties. Split-grain leather uppers mean they are combined with nylon or mesh to make the boots a little more lightweight and comfortable. They are less expensive but they’re also going to be a little less resistant to water and abrasion. Nubuck leather uppers are a type of full-grain leather but they’ve been buffed up to make them look less like traditional leather and more like suede. Because of this they’re actually quite flexible, water resistant and comfortable, but they will take some time to get to a comfortable level. Synthetic uppers are made with nylon, polyester or other types of non-natural products. They are quite light and are easy to break in but they’re going to wear out a lot faster because of the method of stitching which puts pressure on the outside of the boots. Waterproof versions are generally made with some type of breathable product that allows you to keep water out but they are actually so good at what they do they actually can cause your feet to sweat more than other types. Vegan uppers are made without any kind of animal ingredients or byproducts however they will definitely be more expensive. Most often only people who are vegan or do not believe in animal use will purchase this variety. Insulated uppers provide added warmth so if you’re going to be hiking or mountaineering in the snow and ice, these are probably a good idea. See our article on how to waterproof hiking boots for more information and tips. The midsoles are the arch support that your boots provide and they’re extremely important when you’re hiking over rough terrain. 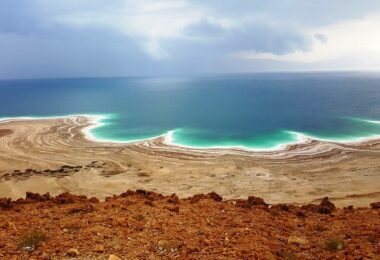 You’ve probably walked in flip-flops or shoes with no soles and felt absolutely every rock or stick you stepped on. Well that’s something you don’t want when you’re hiking, so quality midsoles are extremely important. They’re also made with one of two materials typically, EVA or polyurethane. EVA is more cushioned and they’re going to be lighter (which is nice because you have less pulling on your feet as you walk) but they’re still going to provide firm support and a cheaper alternative. On the other side is polyurethane which is even firmer and lasts even longer, which is great if you’re trying to save money. They also work great for extended trips so if you’re planning on taking a long hiking trip or going through some very rough terrain you’ll probably want to stick with this option. Two things to look at on the outsoles of your boots are the lug pattern and the heel brake. 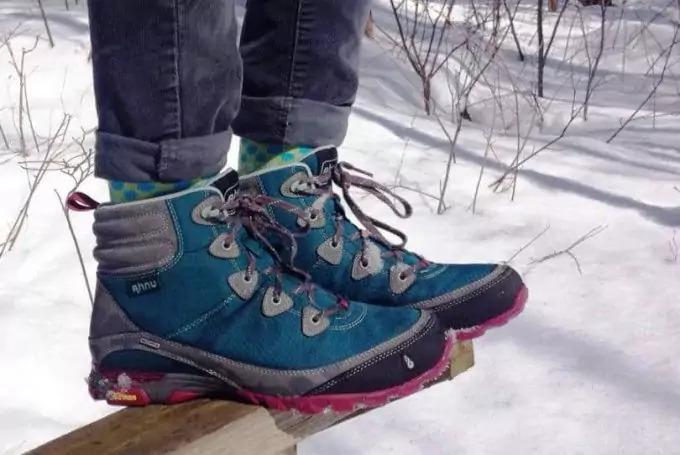 You want to make sure the boots you purchase have both and that they’re going to keep you from sliding in case you need to go up or down a steep hill. Lug patterns are the ridges and bumps on the bottom of the shoes that provide traction. The deeper those ridges are the more traction you’re going to get. The wider they are (further apart) the better your traction as well. With a heel brake you’ll be able to see a distinct heel rather than the entire shoe being the same level on the bottom. The heel gives you something to grip on with while you’re walking, separating it from the front of the foot. Not every type of boot is going to have a rand, but these are a type of rubber strip all the way around the outside of the boot above the midsole, where it connects to the uppers. These are actually really good because the rubber acts as a protectant from water and debris that could otherwise get into your boots through seams or where you’re going to come into contact most with puddles and mud. They’re also going to keep rocks or sticks from scratching the leather. If you have the ability to use crampons on your boots you’ll have two options. These are strap-on crampons and step-in crampons. 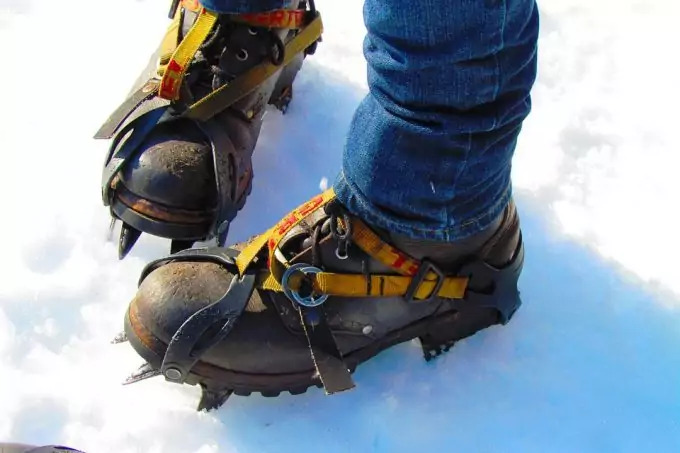 If you plan to go mountaineering or to hike across glaciers you’re going to want the ability to use crampons, though which type you use is up to you and the boots you choose. Strap-on are going to take longer to put on but they can usually work with any boot you want. Step-in are going to require a special kind of boot and are typically quite easy to attach. Once you know what aspects of your boots you need to look at before you purchase them there are a few other things to consider as well. These include the fit of the boots and definitely what you’re planning to do with them. 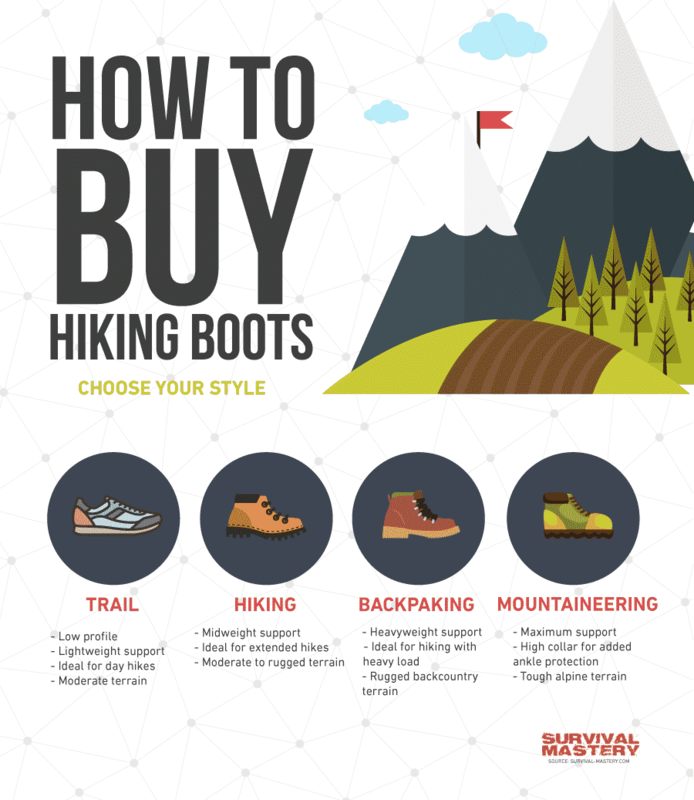 You need to come to an understanding that, if you’re planning on doing different types of hiking you may need to choose several different types of boots, so make sure you know what you’re looking at and what you’re looking for. When checking the fit you need to make sure you’re wearing the right gear with the boots. You want to wear the type of socks (or layers of socks) that you would when you were going hiking because this gives you a better idea of the size you need. Don’t hesitate to read our piece on the top socks to warm your feet while hiking. You also may want to wait until later in the day because your feet tend to swell a little throughout the course of the day and that will make your boots less comfortable at the end of your hike if you aren’t careful. You want them to fit well throughout the day so you don’t end up with blisters. If you typically wear insoles or are planning to you’ll also want to slip those in the shoes before you try them on so you make sure you get the right fit. Then, slip your foot into the shoe and slide it all the way forward. Your finger should fit in between the back of your foot and the back of the shoe but once you lace them up and tie them tightly you shouldn’t have any wiggle room. That isn’t to say they should feel tight. What we mean is you shouldn’t feel your foot sliding at all as you walk in the boots and you shouldn’t feel like you can easily slide your foot around. They should fit firmly around your foot. 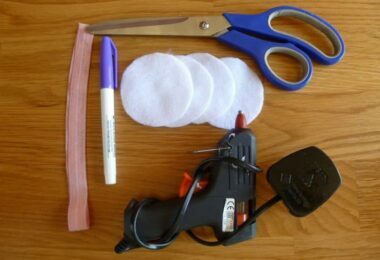 Check to make sure there’s enough padding in the soles as well as throughout the ankle support and tongue so that you don’t feel anything cutting into your skin. You want to feel comfortable in these shoes because you’re going to be wearing them for long periods at a time. If they’re too tight or too stiff it can cause blisters or even cause you to twist your ankle (or worse). 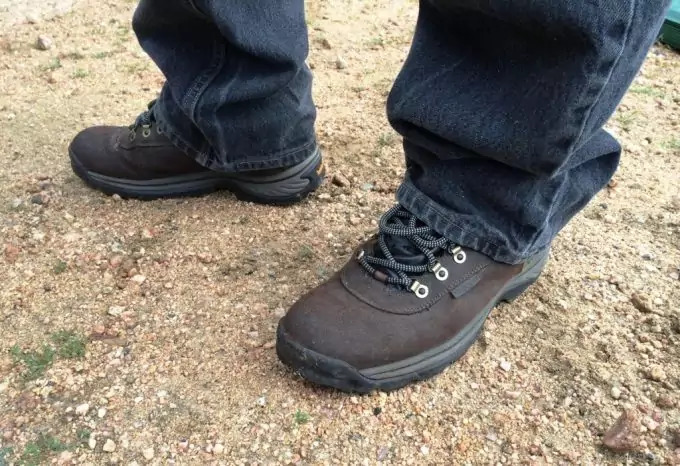 By making sure they feel comfortable and feel padded enough that you can easily wear them throughout an entire day, weekend or even longer (depending on the type of boots you get) you’ll be able to keep yourself much more comfortable and you’ll definitely be able to keep hiking a lot longer. You don’t want to find yourself forced to head back home because your boots don’t fit right and are causing problems for you when you try to walk. It’s definitely going to spoil your day and your trip, plus you’ll have to go get new boots. The most common hiking boots are going to have mid-level supports when you’re talking about men’s hiking boots. The reason is that they are going to provide you a decent number of options for where you want to go. You’ll be able to take short day trips and usually trips for the weekend as well if you like. 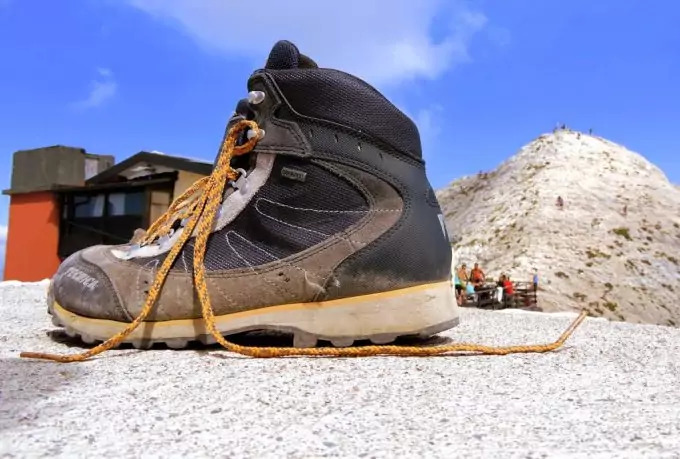 That’s because these boots are moderate in weight as well as reasonably comfortable, so you’ll be able to go wherever you want and in whatever type of terrain you want as well. These boots are made of leather with a rubber sole and have an oiled finished for a little bit of a scuffed look from the start. They feature synthetic material around the ankle for a little more comfort and breathable EVA in the soles to help get rid of moisture and sweat. They’re completely waterproof so you don’t have to worry about water where you’re hiking and have a deep lug pattern to keep you from sliding when walking; including primary and secondary flex grooves to help you stop suddenly. These boots have a leather construction with mesh to provide a more breathable base. They also help you get rid of moisture from water outside or sweat inside and you’ll have plenty of comfort from the lightweight, cushioned midsole. They have super gripping outsoles that still leave no marks so you have no trouble walking but you’re going to ‘leave no trace’ while you’re at it. They have a mid-height support around the ankle so you don’t have to worry about twisting or slipping and work great for day trips and hikes. More moderately priced, these boots are made with leather, suede and nylon mesh to help you get a breathable style that’s also comfortable for any of your daily plans. You’ll also have no trouble walking in them with the mid-level uppers and yet you’ll still be protected from water outside. They also use EVA midsoles for comfort and carbon rubber outsoles to provide you with the traction that you need. There’s even an added insole with extra padding that can be removed whenever you need to clean your boots but provides comfort while you’re hiking. These boots are made with leather and rubber soles to keep your feet protected from the elements whether it’s water and moisture or rocks and sticks. They also fit extremely comfortably right out of the box so you don’t need to worry about breaking them in too much. You won’t have to worry about them getting too hot or uncomfortable during the course of the day either as they breathe quite well and provide you with plenty of support while you’re walking with the mid-level uppers. Moderately priced, these boots are made with leather and feature a special waterproof/breathable dry membrane that is specifically made for Keen. They feature dual-density EVA foam in the midsoles and the EVA foam foot bed is actually removable so you can clean them whenever you like. The non-marking outsole features 4mm lugs which provide you a lot of traction and the ESS shank will give you plenty of stability to ensure you get where you want to go easily, even if the terrain is steep. You’ll also get plenty of ankle support and stability through the mid-level uppers. Women’s hiking boots are more commonly hiking shoes with low-level uppers rather than mid-level. This is because most women tend to have less interest in long-term hiking and generally prefer day or weekend hikes. There are plenty of other options and you can find some mid-level and high-level uppers if you’re planning to go on a longer hike. If you aren’t planning only a weekend or shorter hike make sure you take some time to look for better boots that are going to last as long as you need for your plans. Getting something that isn’t made for the right type of trip is only going to hurt you in the long run. Made from full-grain leather, these boots have Omnishield water and stain resistance and even have compression-molded EVA foam in the midsole for comfort. The lacings are triangular d-rings and clamshell to provide a sturdy attachment. They also have 4” shafts and breathable mesh to provide ventilation and comfort. These boots have an excellent lug pattern to provide excellent traction while you’re walking on your favorite trails or even through mountains and woods. They’re also moderately priced for those just getting started with hiking. These boots feature medium level uppers approximately 3.25” from the arch and have a small heel to provide added support and traction. Made with leather overlays and a special fit lacing system they are guaranteed to fit you perfectly and have special M-Select DRY technology to keep your feet dry as well as keeping them from sweating. They also have E-Foam midsoles to provide you with a shock-resistant surface while walking through rough terrain. You’ll also love the Vibram treads to provide you with even more support and traction. Higher priced than other hiking boots, these boots are made with leather to provide a high quality surface. They also have a 4.75” shaft and moderate heel with a wide platform to provide more stability over rough terrain. They also feature a padded tongue and collar so you get the comfort you need while walking, whether you’re out for the day or out for a week or more. With the special grommets and corded laces you’ll be able to lace up these boots quickly. They also feature breathable climate controlled footbeds and a nylon stabilizing shank. Low priced, these shoes are made with suede and fabric. They have a 5” shaft from the arch and a medium heel to provide more stability. They also feature Dri-Tec membrane over the outside to provide a waterproof surface. They feature an EVA molded footbed and midsoles which are removable and compression molded to provide you with a cleanable surface that is also comfortable to walk on. They also have rubber outsoles that are manmade and provide multi-directional traction no matter where you’re walking. These are also going to work best for short excursions rather than long trips. Made with a synthetic material, these shoes also have a 5.5” shaft from the arch which means they come up around your ankles to keep you from twisting your ankle when walking. The TPU stability heel clip will also provide more stability along with the Numentum Technology. You’ll also get a more comfortable walk with a padded collar, midsoles and tongue. The rubber toe protector also keeps you from stubbing your toes or getting water into the front of the shoe. With self-cleaning lugs you’ll have traction and no need to worry about picking up dirt and mud. After a hard day of trekking, your boots need to be cleaned. So, check our article on how to wash hiking boots before you head outside. 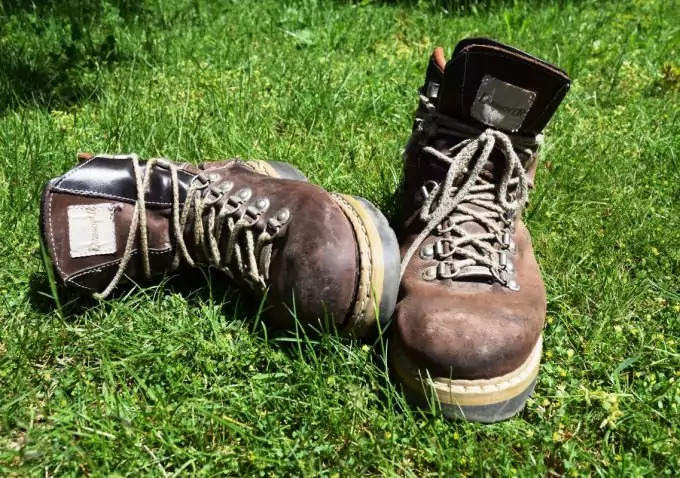 Picking out the best hiking boots is difficult if you don’t know what you’re looking for but there are plenty of ways you can find information about them. You’ll be able to find the perfect boots for your needs and for wherever you’re planning to go. With everything you now know, you should be more than ready to get started. So start looking at some of the best options out there and before you know it you’re going to be ready to start hiking. Whether you want a simple day trip or a long week outing, there are boots out there for you. Choose the boots that are going to make a great trip for you. Whether you’re looking for short boots or mountaineering boots, you’ll be able to find them. The best thing is even to shop in store because you’ll be able to try on different boots and see which are the most comfortable and the warmest as well. Keep in mind what you really need and of course your budget. You’ll be able to find a lot of great options within any range so you’ll have the best hiking boots around, and at a great price too.